The standard number of permanent teeth in an adult is 32 and the number of primary teeth in an infant is 20. When a person grows an excess number of teeth in addition to the standard number, the condition is defined as ‘Hyperdontia’. It is an oral condition characterized by having supernumerary teeth in the mouth in any part of the dental arch. 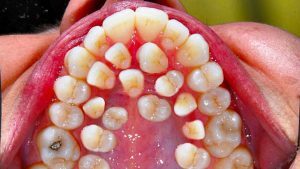 How common is the dental condition Hyperdontia? Growing an extra tooth is very common, but multiple teeth growth is quite rare in individuals. The condition is usually determined by certain factors like the ethnicity of the individual, location, and other associated syndromes. The occurrence of the dental condition Hyperdontia is, however, less ranging between 1% and 4% of the population. The male to female ratio is 2:1, with a majority of cases dealing only with a single tooth. The rare condition of supernumerary teeth is classified by its position and shape. ‘Mesiodens’ is the common condition of supernumerary teeth that appears like a peg-like, malformed tooth between the maxillary central incisors. A supernumerary tooth is generally referred to as a paramolar, mesiodens or a distomolar from the perspective of its position. These teeth do not sprout in the oral cavity, rather they show as malocclusion. The following discusses Hyperdontia types based upon its shape. In medical terms, an odontoma is a dental hamartoma that consists of regular dental tissues that have developed in an irregular way. Compound odontoma is described as multiple small-like tooth formations that appear in the anterior maxilla. There are three dental tissues- dentin, enamel, and cementum that have a lobulated appearance in compound odontoma, thus making it difficult to demarcate the tissues separately in individual ‘’toothlets’’. In simple words, it is described as a disorganized mass of dental tissues. The dental condition appears in the posterior maxilla and is unrecognizable as dental tissues. Composed of both soft and hard tissues, Complex Odontoma has no similarity to a normal tooth. It usually presents a radiopaque area having varying densities. This type rarely erupts and is linked to a delayed eruption of incisors. Tuberculate Hyperdontia type appears like barrel-shaped and has more than one tubercle. Tuberculate supernumeraries are generally present on the palatal aspect of the dental arch in central incisors. ‘Supplemental’, as the name implies, is extra teeth growing in the mouth to the end of the regular teeth series. The supplemental tooth appears like the rest of normal teeth and is actually a duplication of the regular teeth. ‘Permanent maxillary lateral incisor’ is the most common type of supplemental tooth. Sometimes, however, the condition erupts as molars and premolars. The conical tooth appears like peg-shaped and is present in the permanent dentition/permanent maxillary central incisors. The base of such tooth is wide, while it narrows towards the tip making it look sharp. A conical tooth is occasionally visible inverted and high into the palate. Displacement of regular/permanent teeth– An extra tooth or clump of teeth may displace the actual position of your permanent/regular teeth leading to discomfort and uneasiness in the mouth. The typical symptom is defined as Hyperdontia in medical terms. Tooth crowding– The gum line is naturally designed in a way to hold the natural number of teeth that an adult has. Therefore, extra tooth/teeth growing in the gum line is called overcrowding resulting in deformation and displacement of the alignment. An abnormal change in facial appearance– The right set of aligned teeth in the mouth determines the correct facial appearance and a perfect smile. However, those suffering from Hyperdontia may experience lack of self-confidence due to distortion in appearance because of abnormal growth of teeth changing the normal dental structure. Speech problem– Abnormal growth of teeth in the mouth in addition to the regular dental structure may adversely affect normal speaking abilities. This may hamper learning abilities in children, affecting their speaking tone and communication. An obstacle in permanent tooth growth– Sometimes, when the primary teeth do not fall in the normal course of time, it causes an obstacle to the maxillary central incisor leading to an abnormal growth of permanent or supernumerary teeth. Due to extra teeth eruption, the growth of natural tooth adjacent to it is poorly affected. Environmental reasons– It has yet to be researched and found which particular environmental element triggers such a rare dental condition. Hereditary condition– Children having parents suffering from Hyperdontia are likely to acquire such a condition. Ehlers-Danlos syndrome– When a cluster of connective tissues grows in a disorderly manner, it gives rise to complications in the normal teeth structure. This is one of the rarest hereditary syndromes that trigger loose joints resulting in bruised skin, dislocation, painful joints and muscles. Cleft palate and lip– This is a common birth defect wherein the tooth/teeth appear in a conical shape on both sides of the cleft lip or palate. As a result, the dental defect leaves slit opening in the upper lip causing trouble in eating and speaking in the patient. Down’s syndrome– Children suffering from Down’s syndrome (genetic chromosomal disorder) tend to get Hyperdontia. Gardner Syndrome– This is a rare genetic syndrome wherein the patient, usually a child, develops multiple benign tumors inside the jaw area, several polyps in the bowel and multiple skin cysts. Cleidocranial Dysplasia– When a person is born with no clavicle or partial bone, it leads to abnormal development of the collarbone and skull. As a result, it results in the distance between the two eyes, cleft mouth, infections and hearing impairment. If the extra tooth/teeth do not visibly show up, dental X-rays can diagnose them easily. Experts may suggest CT scan for a clearer picture of the teeth, mouth, and jaw. 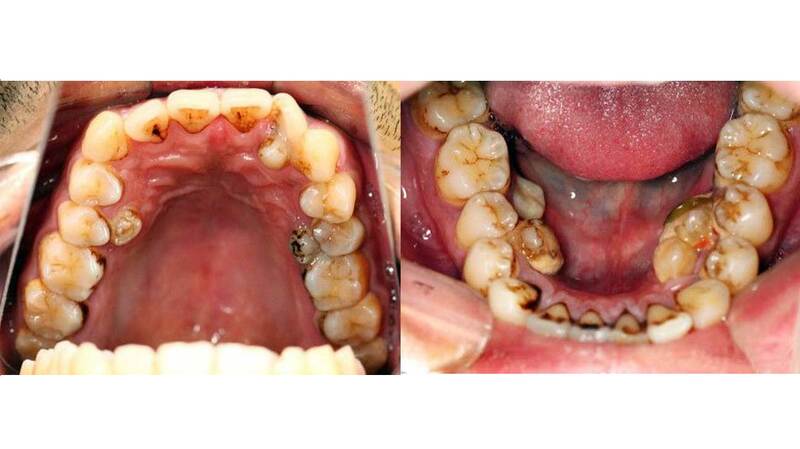 Sometimes, lots of further examinations are required for proper detection of Hyperdontia. Doctors usually recommend various clinical examinations for the same. These are often used for the diagnostic process to ensure a clearer picture of your dental arch. Although panoramic radiograph is a great way of screening your dental condition, the midsection still shows a vague picture. This is regarded as most useful that helps in evaluation of the buccolingual position of your dental mesiodens, which do not show up clearly in regular radiographic tests. If a patient experiences any of the issues linked to Hyperdontia, then he/she should refer to a doctor immediately. It is never know how poorly your supernumerary tooth/teeth have affected the regular teeth series. Before things turn out too late for your dental health, it is advised to see a physician for detection of abnormality in normal teeth growth pattern. Foremost, the patient is recommended to get a dental x-ray, which may be followed by a series of radiographic tests, if required. If supernumerary teeth are diagnosed and they are impacting the permanent and primary teeth, necessary treatment follows. The extraction method is applied when the supernumerary teeth are fully or partially erupted. Dental surgeon administers general or local anesthesia and uses a kind of tool called an elevator to extract the tooth/teeth. The tool is used to gently wiggle the tooth in order to make it loosen from the socket. Then, dental forceps are used to grasp the tooth and pull it out. A surgery is required when the supernumerary tooth gets entangled with the permanent tooth. Surgeons follow the same surgical treatment of root canal for this condition. A sedative or anesthetic is given to the patient and once the oral area becomes numb, surgery follows. A small incision is done around the impacted tooth in the gum area and also in the bone to get access. The impacted tooth is then broken into several pieces and each piece is carefully removed. Once the impacted tooth is completely removed, the incision is stitched closed. Post-extraction or removal of an impacted tooth, the normal alignment of the adjacent tooth may get adversely affected. Therefore, as part of orthodontic treatment, dentists suggest dental braces to be worn on the permanent teeth to restore its normal alignment and also to strengthen them. This is the last process of treatment that requires the patience of both patients and doctors. A dentist should invest time in observing the development of supernumerary teeth and the effect they have on the adjacent teeth by taking reports of X-rays. It should be noted that orthodontic tooth removal measure should be undertaken only if additional tooth obstructs the natural alignment of permanent teeth. Orthodontic treatment is only required when the growth of supernumerary teeth causes significant crowding or delayed eruption of the nearby teeth. If not treated on time and the problem is retained, it may lead to the development of tumors or cysts. There is no need for surgical treatment of hyperdontia unless the extra teeth pose a risk for aspiration or improper passage of air to the lungs. An adult has in total 32 teeth, including 8 incisors, 8 premolars, 4 canines and 4 wisdom teeth. When the person grows more than this natural number, the condition is defined as Hyperdontia. A child may also grow extra teeth in addition to primary teeth that he/she has, which is also called Hyperdontia. These are supernumerary teeth that are placed in between the front two incisors in the upper jaw. They sprout on the palatial side or vestibular of the incisors. What are the different types of supernumerary teeth? They include Supplemental, Complex Odontoma, Compound Odontoma, Tuberculate, and Conical. 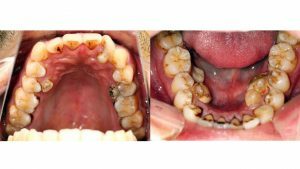 What are the risk factors associated with Hyperdontia? The risk factors associated with hyperdontia include Gardner syndrome, cleidocranial dysplasia, cleft palate and lip and Ehler-Danlos syndrome. How are supernumerary teeth diagnosed? Only a personal dentist or orthodontist or a professional or surgeon can diagnose the presence of supernumerary teeth through X-rays or by conducting various radiographic tests. A patient usually visits a doctor when he/she suffers discomfort in the mouth or issues with eating and speech due to an extra growth of teeth that impacts the permanent teeth. Often toddlers are diagnosed with hyperdontia. Parents notice it when their children start losing baby teeth in the beginning years of their school. Children suffering from certain childhood diseases or anomalies often show a prevalence of hyperdontia. Since Hyperdontia can attack anybody from a child to an adult, one should stay aware of his/her oral hygiene and should go for a checkup to a dentist if there is any feeling of discomfort in the mouth. It is advised to learn about the causes, symptoms and treatment procedures to prevent the condition of supernumerary teeth.